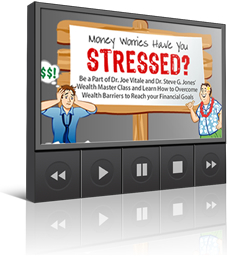 Would You Like To Know The Secret To Really Becoming Wealthy? What would you say if I told you that becoming wealthy and having all the money you could ever desire isn’t really that hard? And what if I told you that you already have ALL the tools and resources that you need within you to become rich? And what if I told you that it’s simply just a matter of “activating” these tools and you will begin to attract money into your life faster than you can keep track of? Listen Close..Does This Story Sound Familiar To You? 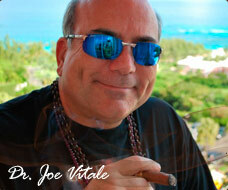 My name is Dr. Joe Vitale. You may have read any one of my 30 books, listened to some of my best selling programs or seen me on national TV. And that’s all great but the purpose of this letter is to introduce you to the Joe Vitale that many people don’t even know existed not too long ago. You see, back then I had no money. In fact, I lived on the streets of Ohio. I knew I was fairly intelligent and felt like I could offer something great to the world but everything I tired tried turned into utter disaster. I was beginning to think that having money is just not meant for me. I could only dream about what it must feel like to not have to worry about money. I used to wonder how much different my life would be if money flowed easily to me like it seemed to do for so many people. I even felt a little resentful that others seemed to “attract money” no matter how lazy, unmotivated, untalented or uneducated they may have been. I was close to giving up. I couldn’t really take much more of being broke. It was taking a toll on me both physically and mentally. Frustrated, angry and losing control. And the more I tried to gain control, the more things went wrong. Should I get a low paying job just to survive? Do I follow my passion and risk it all? And even if I picked one of those paths, what do I need to do first? I needed the EXACT steps that would turn my life around. And I needed them FAST. It’s a question that took me many years to answer. It took such a long time because all of the right answers came from all the wrong ones. It’s kind of like the process of elimination. Every time you fail, you get closer to the right answer. But boy is it tiring. In fact, it’s downright painful. But once it’s over…it’s over. The problem is that most people don’t have the time to play this game of failing until you finally hit a winner. There are just too many other things that need immediate attention. All this stuff has to be taken care of right now. But at the same time it’s blocking you from getting out of the rat race. I’VE BEEN THERE AND I KNOW HOW TO TURN THINGS AROUND….FAST. Now it may be no surprise to you that I have completely turned my life around and have showed countless others how to do the same. But what you may not know is that much of what I teach is based on something called the 80/20 rule or The Pareto principle. The 80/20 rule states that 80% of the results come from 20% of the action. Now sometimes the ratio isn’t exactly 80/20. Sometimes it’s 70/30 or 90/10. But the point is that.. So many times people wrapped in trying to do too many things to attain wealth when in reality they really only have to do a few things. They just have to do them right. That’s what we call leverage. Leverage is the ability to do more with less. Think of it almost like a seesaw. 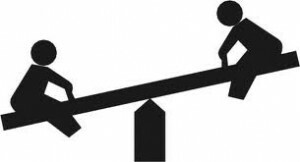 You see how easy it is for the person on the left to lift the person on the right? Now imagine that person on the left trying to manually pick the person up on the right with no leverage. That would be pretty tough to do. That person would be using all of their energy and strength and still not getting the best result. Well if you’ve been trying to become wealthy and you’ve been unsuccessful thus far it’s probably because you’re not using leverage. And my guess is that you’ve probably tried everything. Tried doing good for others. Maybe even invested in a business venture or two. Only to wind up unsuccessful, frustrated and weakened. A while back I was with my good friend and hypnotist to the stars Dr. Steve G. Jones. Steve is one of the most successful hypnotists on the planet. He’s also a self made millionaire. He was telling me that one of the biggest challenges people come to him for help with is having the ability to create wealth. I could totally relate because that’s what people come to me for help with most of the time as well. So we began to have this intense conversation about what it really takes to make it happen. And we landed on the topic of leverage. I asked Steve 20 of the most important questions I could think of when it comes to building wealth and then he did the same thing to me. What we got was some truly groundbreaking secrets. Since then we’ve sent the interview to a videographer to improve the viewing quality and assembled it as a fancy little program with 40 videos called “The Wealth Master Interviews” but in actuality it’s just us sharing some intense secrets over a conversation. So what you will hear is pretty similar to what you would hear if you were having dinner with us and we were having this same conversation. And that’s usually where you get the real golden nuggets of information. Go ahead and purchase this interview course right now at the heavily discounted price. Then take the next 60 days to go through the material and put it to work in your life. If it doesn’t help you achieve unlimited wealth, simply send my support team an email and we will issue you a full refund. No questions asked. The Wealth Masters Interviews is easily worth a couple of thousand dollars. In fact, at one time people were paying upwards of $5,000 to spend an evening with me to learn these same secrets. But as I said before, our goal was to use this information to help other people. So today you won’t pay anywhere near $5,000. In fact, you won’t even pay $1,00o. If you order today as part of this introductory offer you can the entire behind closed doors interview for just $37. We’ve elimaited all the guess work. And we’ve made the transition into the good life. Not it’s time you do the same. There’s no reason to continue making things hard on yourself. Grab the Wealth Master Interviews right now at the heavily discounted price and the start using leverage to achieve wealth faster and easier. PS – Remember this is not theory. These are the proven secrets that we’ve used to change our lives and they can help you too. PPS – Also, if for any reason you are not satisfied we will buy The Wealth Master Interviews back from you. No questions asked.